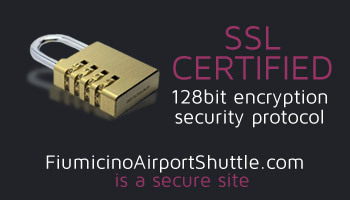 Fede Wide Group will collect through the website www.fiumicinoairportshuttle.com some personal information, including first name, surname, email address, phone number, mobile phone number, credit card number if required. The above data will be collected, if necessary, using the data entry form reported in the registration, booking and email services, under various configurations. 2.2. The personal information provided is collected in compliance with law, contract obligations and guarantees, and the regulations applicable thereto. Data are processed by telematics methods, including electronic means, in compliance with procedures strictly related to the above purposes, and in any case, with the purpose to ensure data security and confidentiality. The party enjoys all the rights as per art. 7 of the Legislative Decree 196/2003.